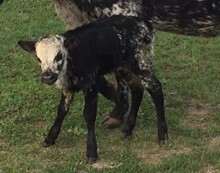 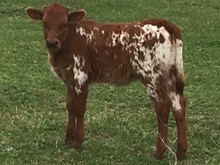 We were searching for a Herd Sire that would give us the exceptional horn, twist, size and color that we breed for and this young stud knocks it out of the park on all counts. 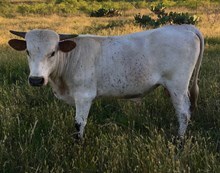 Thank you Dickinson Ranch for this amazing animal. 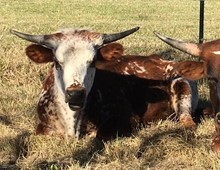 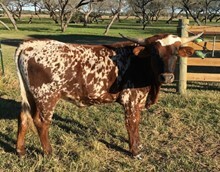 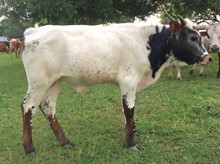 His legendary sire, Hunts Command Respect, has produced countless industry leading cattle and his dam, World Champion cow Jester, with her flashy color and over 90 inches of twisty horn, is one of the cornerstones of the DCCI program and has always been my personal benchmark for what a Longhorn cow should aspire to be. 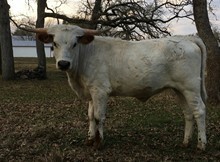 Jest Command, or Jimmy as we call him at home, is painfully handsome, gentle and gets the job done- just like our Dad. 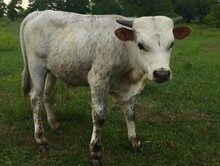 He’s with the brood cows now and his calves have been incredible. 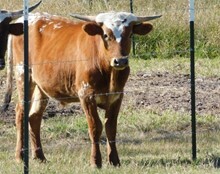 Fasten your seat belts kids- this one’s gonna be exciting!